Two black journalists were on Sunday disallowed from entering the premises of a church meant for White ONLY in South Africa. 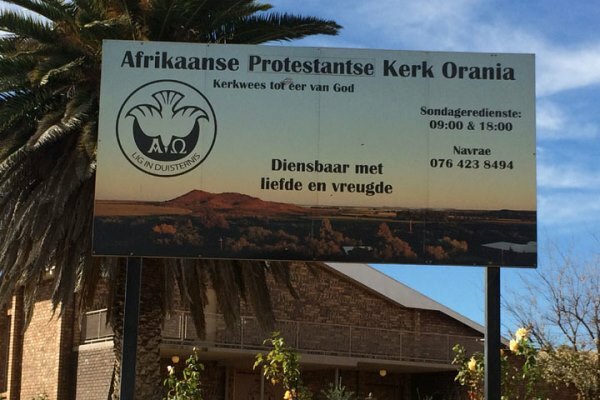 The Afrikaanse Protestante Kerk church in Orania, told the journalists “the church is only for whites”. Orania is an Afrikaans-only South African town located along the banks of the Orange River, in the arid Karoo region of the Northern Cape Province. The journalists were on an assignment and decided to attend a Sunday service before returning to Pretoria but they were intercepted by a church leader, identified as Mr. Theunis Oukamp, at the door. According to Africa Review, Oukamp said allowing black people into an all-white church would be violating the “rights of Afrikaans people”. “I am now in a difficult situation. You know that Orania, is only for white people, this is why we are here. “You must understand I know you want to serve God and everything but I have to protect the rights of Afrikaans people. So I cannot let you in, you guys can go to any other church, but this one is only for white people,” Mr. Oukamp told the journalists. Mr. Langton Ndlovu, a Christian, described the move as ‘diabolical’. “This is demonic, in this day and age, I never thought this was real. That’s unacceptable. I wonder how they read the scripture that says “there is neither Greek nor Jew” but we’re one in Christ,” said Mr. Ndlovu. The president of the South Africa Union Council of Independent Churches, Archbishop Modiri Patrick Shole, expressed shock that there was still segregation in the body of Christ, 23 years after apartheid ended. “We don’t discriminate in church because before God we are one – whether white or black. I find it weird that we still have discrimination in the church,” he said. I HOPE those Afrikaans are preparing for a heaven different from that which blacks are aiming for, so that their rights as Afrikaans won’t equally be violated. Good for those south africans, since they decided to be killing their own brothers from other african countries. They will soon go back to the period of apartheid. Thank you Chris for your comment, they are so wicked and think they are superior to other black Africans. God help us. You haven’t seen anything yet, God will punish you South Africans for killing your fellow brothers and sisters.He will continue to make these white people thorns in the flesh for you in different ways and no one will be able to deliver you from them. Evil people. Chris you have the right word, i wish they white will soon domintae them again, i wish they will defeat ANC IN THE NEXT ELECTION,South Africans blacks are a disgrace to the entire world black race. This is a secret society where members must be racially homogeneous nothing else. You cannot be true followers of Christ by engaging in hate. I think the black south africans are beginning to reap their recompense in full. Our almighty God has a way of judging the human race. What’s happening here is a glimpse of what is yet to come upon the entire black south africans for shedding the blood of their fellow africans. You are on point they cant hurt a white but busy killing their fellow blacks.Never seen a race like black race so jealous and wicked within themselves. THE ONLY TERRORIST WE HAVE ON THIS EARTH ARE THESE SO CALLED. THEY HATE OTHER PEOPLE AND MAKE YOU FEEL INFERIOR.